It presents five permanent exhibitions: Prehistory of Wielkopolska, Poland was established here, Death and Life in Ancient Egypt, Archaeology of the Sudan and North African Rock Art. These exhibitions are equipped with multimedia, some with touch panels and LCD screens. Some exhibits are interactive and visitors can try their hand at creating a rock art rite, assume the roles of archaeologists working on a dig or try on a real medieval knight’s chain mail. This municipal residence of great splendour that belonged to a prominent Wielkopolskan family was erected in the years 1544-48, replacing old Gothic burgher houses. Built for Andrzej Górka of the Łodzia coat of arms, the governor of Wielkopolska, the rectangular palace consisted of two buildings connected through a gate wing in Klasztorna Street. The Górkas, starting with the above-mentioned Andrzej, were sympathetic towards the Reformation and so the palace became a centre of Lutheranism. When Stanisław, the last male descendant of the family, died in 1592, the palace was inherited by the Czarnkowskis. 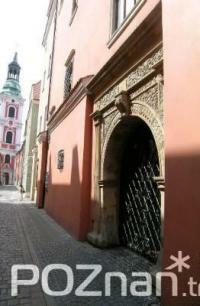 Four years later it became the property of the city which sold it to the Benedictine sisters from Chełmno. After the suppression of the order in 1833 the palace housed a grammar school for girls and after 1880 was used as a tenement. It has been rebuilt several times but the walls of the cellars and the ground floor remain virtually intact. Damaged in a fire during World War II, the palace was painstakingly rebuilt after the war and presently houses the Archaeology Museum. The Renaissance sandstone portal (in Klasztorna Street) is most probably the work of an Italian artist. The frame of pilasters supporting the lintel features an arcade with a semicircular arch. Rich ornamentation includes garlands of laurel leaves, cornucopias, masks, flower motifs, grotesques and the engraved date of 1548. The portal opens onto the inner yard with a tree-wing arcaded gallery whose pillars, presumably the work of Silesian stonemasons, have survived to the present day. 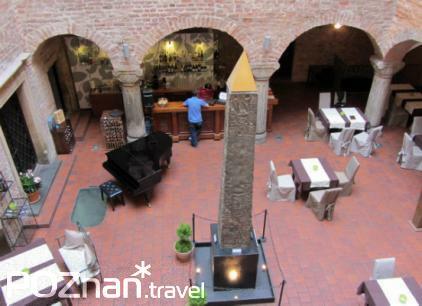 The yard, which has been recently covered with a glass roof, features a 3.2 metre-high Egyptian obelisk from around 1200 BC. The Archaeology Museum is one of the oldest of its kind in Poland; it continues the tradition of the Museum of Polish and Slavic Antiquities established in 1857.